Rotisserie cooking requires three key components: The spit assembly, a means to turn the spit, and a heat source for cooking. 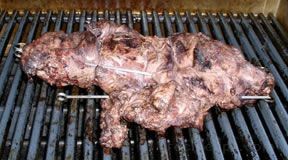 The spit refers to a device consisting of one or more metal bars onto which meat or other foods are skewered. There are two types of spits that are used most often. The first one is a long skewer that is pushed through the food. The skewer may resemble a heavy round bar depending on the size of the rotisserie unit and the total weight that must be supported. After the meat has been skewered, two prongs (or "forks") are attached to each side of the meat to hold it in place. The spit, or skewer, is placed on brackets that allow the food to be suspended above, or in front of, a heat source. A second type of spit is a split rod assembly in which two narrow skewers are pushed through the food and are attached to gears on both ends of the rotisserie unit. 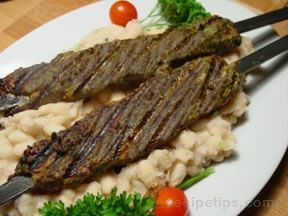 Because two skewers are used, there is no need for the use of additional hardware to prevent the meat from slipping on the skewer while rotating. The spit rotates (by hand or by a mechanical device) constantly at a slow speed. The rotating motion of the rotisserie ensures even cooking, and allows the meat to self baste with its own juices. The meat develops a smoked flavor and a perfect crispy crust. 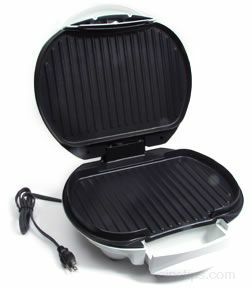 Modern rotisseries are equipped with an electric motor, which allows for even rotation of the food. The first rotisseries were crude devices that allowed for food to be rotated manually while it cooked over an open fire. Before electric motors were specifically built for rotisseries, almost any method imaginable was used to power the rotisserie, although a hand crank was most commonly used. Manually operated rotisseries are still occasionally used in fireplaces and over open outdoor fires. 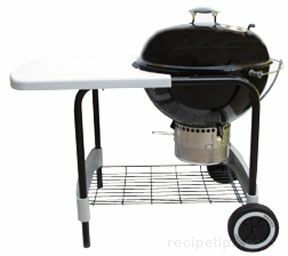 Some rotisseries are built as attachments for outdoor charcoal grills and are standard equipment with many outdoor gas grill models. There are also a variety of indoor electric countertop rotisseries, which consist of a self contained oven-like cabinet with a heating element in the back. The food rotates on a spit in front of the heat source. The units come with temperature controls, timers, and a drip pan for collecting any melting fat. Before cooking with a rotisserie, it is important to read the instruction manual included with the rotisserie. Make sure that the unit is used correctly and that safely instructions are always followed. If the rotisserie unit will be used with a charcoal or gas grill, it is important that the rotisserie is designed specifically for the particular grill that is being used as the heat source. Cuts of lamb that have a basic cylindrical shape and a fairly even distribution of weight are suitable for cooking on a rotisserie. Good choices include leg of lamb, rolled shoulder, and whole lamb. Lamb cooked on a rotisserie can be positioned to allow for direct cooking or indirect cooking. Placing the meat directly over the heat source results in direct cooking and a grilled quality, although this usually works best for small cuts of lamb. Placing the meat in front of or next to the heat source allows the meat to roast and is best for larger cuts. When cooking lamb rotisserie style, the indirect cooking method is most often used. Both charcoal and gas grills must be preheated before rotisserie cooking can begin. 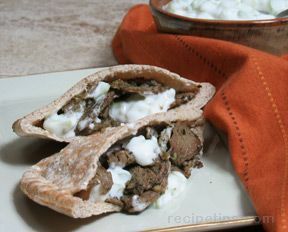 (Refer to the article, "Grilling Lamb" for details on preheating.) Rotisserie is a slow cooking process. The best results are achieved when lamb cuts are seared at a high temperature for the first few minutes, followed by low to medium/low heat for the remainder of the cooking time. A rotisserie ring is beneficial when using a charcoal grill because it allows the spit to be positioned at the perfect height in relation to the heat source. Cooking with a rotisserie is a long, slow process, which allows the fat in the meat to melt slowly. 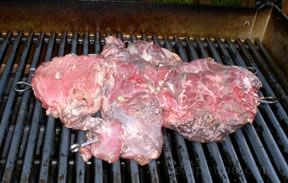 As the meat rotates on the spit, it is continually basted with the melting fat, which prevents the meat from drying out. The meat is close enough to the heat source to allow a crispy crust to form on the surface. When rotisserie cooking on a charcoal grill using indirect heat, the fire is built on the side of the kettle or in a ring around the perimeter, away from the location where the food is to be positioned. The meat is cooked by radiant heat rather than direct heat (as if in an oven). None of the hot coals should be under the meat. A drip pan is placed directly under the meat (a disposable aluminum pan works well). Due to the extended cooking time, fresh charcoal must be added every 30-40 minutes to maintain the proper cooking temperature. Place the rotisserie ring inside the charcoal grill. Place the charcoals on one side of the grill so that they are mounded parallel, but away from the spit. Make sure the coals are well lit and the grill is preheated before the meat is mounted to the rotisserie. A drip pan should be placed directly under the location of the spit. 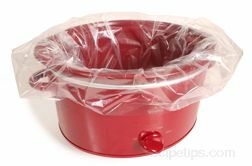 Because the drip pan will help to prevent flare ups, it is important that the drip pan be at least as large as the meat. Pour ½-inch to 1-inch of water into the drip pan to create steam, which will rise and help to prevent moisture loss in the meat. Slide one pair of prongs (a tool that resembles a large fork) onto the spit and then push the spit and prongs into the meat. Slide the other set of prongs on the opposite side of the spit and insert the prongs into the meat. The prongs prevent the meat from slipping on the spit as it rotates. Both sets of prongs usually have a wing nut that should be tightened to keep them firmly in place on the spit. The spit is then attached to the brackets of the rotisserie assembly. One end of the spit slides into the motor. Some rotisseries have counterweights that can be adjusted to provide proper balancing of the meat on the spit. The meat should be balanced on the spit to prevent uneven cooking and possible overworking of the rotisserie motor. When spit has been balanced, start the motor and observe the rotation to ensure that the spit is balanced and there are no obstructions. Check for doneness with a meat thermometer before removing the meat from the heat source. Remove the spit from the grill with heavy oven mitts and remove the spit from the meat. Cover the meat with foil and allow it to rest for a few minutes or for whatever length of time is appropriate for the particular lamb cut. The best gas grills for use in rotisserie cooking are models with front and back burners or models that have three burners arranged in a line front to back. The burners should be ignited to allow the grill to preheat before the meat is placed on the rotisserie. When the grill has preheated, all of the burners except for the rear burner are shut off. The spit is positioned over the front or center burner so that the food is not directly over the heat source (the rear burner). If the grill has only two side-by-side burners, set both of the burners on low. When a drip pan is placed on the grate, the meat will be shielded by much of the direct heat of the burners. Preheat the grill by setting all of the burners on high for a few minutes. The lid of the grill should be lowered and remain closed to ensure even roasting. Rather than relying on a cooking time chart for proper doneness, always use a meat thermometer. The chart does not allow for the many variables that often influence doneness. 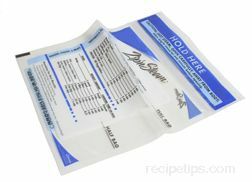 A cooking time chart should be used as a guide only and should not be used as a substitute for the accuracy of a good meat thermometer. To accurately check temperature, the thermometer must be pushed through the thickest part of the meat and away from any bones (bones conduct heat). 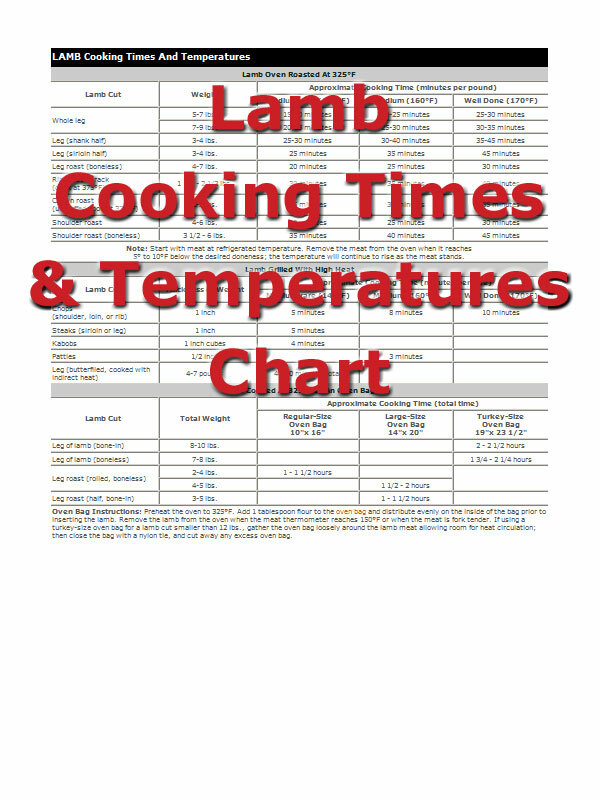 The minimum temperature recommended for cooking most lamb cuts is 140ºF. (During the resting period, the temperature of the meat will rise an additional 5ºF or so, to the minimum recommended safe temperature of 145ºF). 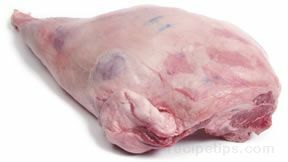 Any boneless lamb roast that has been rolled, stuffed, and tied (such as a boneless shoulder roast), should be cooked to a minimum temperature of 160ºF. (During the resting period, the temperature of the meat will rise an additional 5ºF or so, to the minimum recommended safe temperature of 165ºF). It is also easy to visually determine when the lamb is thoroughly cooked. 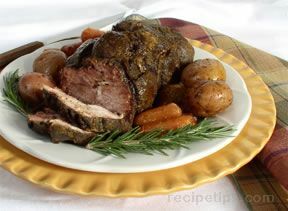 The exterior of the lamb will appear crispy with a dark brown color and the meat will begin to split apart. 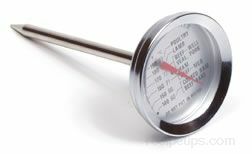 Even with these visual signs of proper doneness, it is still recommended that a meat thermometer be used to verify the internal temperature of the meat. A dressed lamb weighing about 25 pounds works well for rotisserie cooking. Depending on appetites, this should be enough to serve 12 to 18 guests after cooking and carving. Make sure to order the lamb far enough ahead of time so the butcher has plenty of time to prepare the lamb. 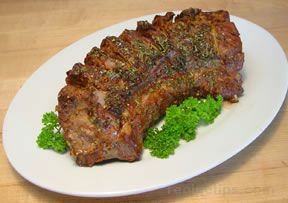 If the lamb is to be marinated, a minimum of 4 hours is required for the meat to marinate before cooking. 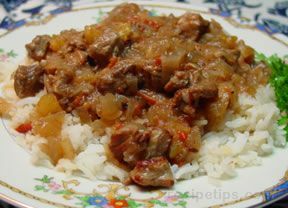 If the lamb will not be marinated, the meat can be seasoned just before it is ready to cook. There are many recipes for cooking lamb with a rotisserie, but high quality meat usually does not require too many additional flavorings. 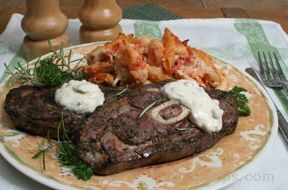 A marinade of olive oil, lemon juice, pepper, and oregano works very well or a rub of fresh herbs, such as basil and oregano in addition to black pepper and crushed garlic, is also popular. The combinations of flavorings are almost endless. 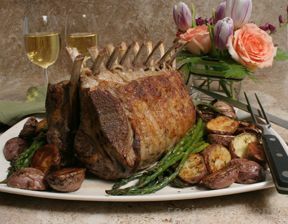 The prepared lamb can be cooked on a rotisserie over a charcoal grill or gas grill, but if the lamb is too large for the standard backyard grill, larger rotisserie units can be rented at many party supply companies. The units are usually in the form of an elongated charcoal grill that represent a fire pit that has been raised several feet from the ground. 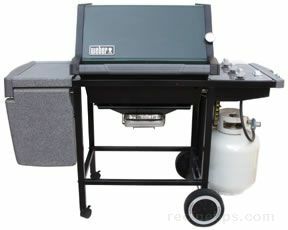 The units are equipped with a heavy duty rotisserie that can easily accommodate a 25 lb. lamb or larger. For a change of pace, the lamb can also be cooked over an open fire. Make sure to have a minimum area of 6 by 6 feet for the fire and rotisserie unit. A large clear zone free of brush and overhanging tree limbs is necessary. Fire pits constructed of masonry walls of at least 2 feet in height work the best. The masonry helps to contain the fire and it protects it from wind. The heat from the fire remains in a more localized area, which makes it easier to control the heat in relation to the rotisserie. Keep children away from the fire and always have a fire extinguisher handy. Make sure to have plenty of firewood on hand. The rotisserie should be set up in front of the fire, not over it. A drip pan should be placed under the meat. If it isn't possible to set up a motorized rotisserie unit while using an open fire, this may not be a practical method of rotisserie cooking unless people are willing to share the burden of turning the spit by hand. It is hard to match the flavor of the meat, especially if aromatic woods are used in the fire, such as oak, apple, or cherry.